This species is found throughout most of Mississippi River system, some of the southern and western tributaries of the Great Lakes, and some tributaries of Hudson Bay. It is considered stable throughout its range except parts of New York and in the western plains states. Comments: The flutedshell can be best identified by the wavy flutings on its posterior end. These flutes alternate in rounded hills and valleys resembling corrugations. The shell’s lateral teeth are absent or so reduced they do not interlock. 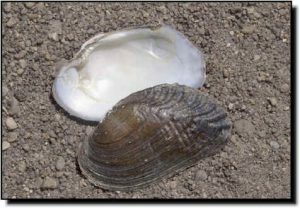 In Kansas, the flutedshell can be found in riverbeds of mostly gravel and moderate current within the Spring and Neosho rivers. 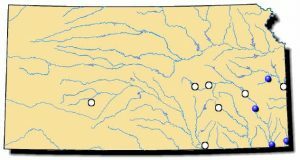 It was formerly found in the Marais des Cygnes River but there are recent records from Pottawatomie Creek. Also, there is a 1942 record from Hodgeman County. The native fish hosts are interesting because they are relatively unrelated, belonging to four different fish families.